Man, I love Sci-Fi Dine-In Restaurant in Disney’s Hollywood Studios. I hardly ever go, because it’s next to impossible to review the place since it’s SOOOO dark (you guys would laugh if you knew what I did to get good lighting for these shots); but I really do enjoy it. And I couldn’t wait to head over to try out the new menu on my trip to Disney World last week! And this review experience comes just in time for the super busy Star Wars Weekend time of the year — as well as the newly announced Star Wars-themed character meals that will be available for a limited time at Sci-Fi and Hollywood & Vine. It will be breakfast here — but at least you’ll get a feel for the place. AND — they’re changing up the film reels in a super fun way for the occasion! If you haven’t had the chance to take in dinner and a movie here, allow me to show you around a bit. I’m pretty sure you’ll be booking a table — er, car — on your next Disney World visit. 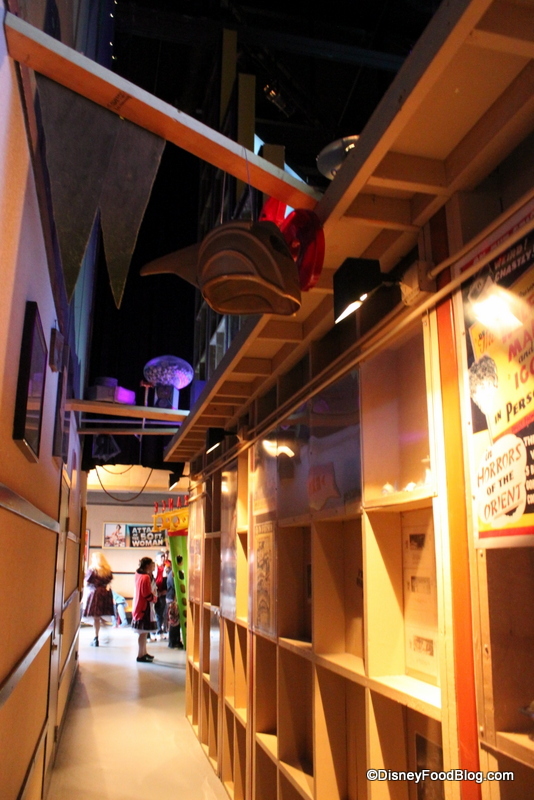 You’ll find Sci-Fi Dine-In at the corner of Commissary Lane and the Streets of America. It’s just a stone’s throw from the counter service spot, ABC Commissary, and next door to Writer’s Stop (of Carrot Cake Cookie fame)! 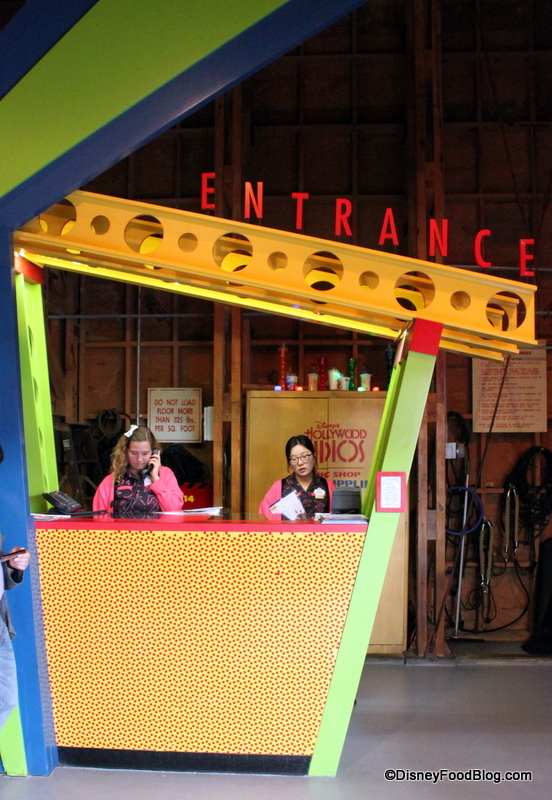 Enter and head to the totally tubular — sorry, but it’s completely 80s at the entrance — check-in desk, and give them your name. Beyond the hostess stand, take some time to look at the cool retro posters, which definitely give you a better sense of the 50s feel they’re going for. While the main dining room looks like an open-air drive in theater, the waiting area and the walkway to the dining room feels like you’re behind the scenes on a soundstage. Is it a movie, or real life? Walkway into the Dining Room, Looking Back to the Waiting Area. See the Rocketeer Helmet? You never know what crazy “props” you might spy here. 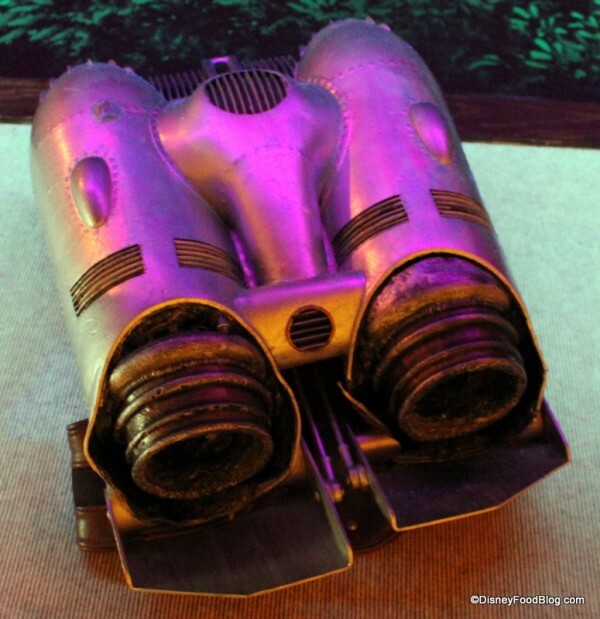 This rocket pack would be perfect for a quick getaway during the Indiana Jones show, don’t you think? More Walkway Themeing — a Rocket Pack! 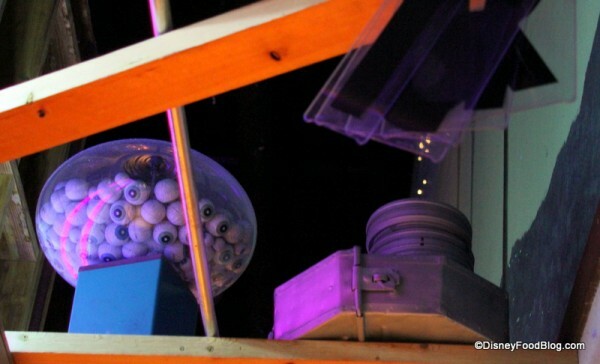 I just love the bowl of eyeballs. I can never resist snapping a pic. After your short walk from the waiting area, you enter this room. And it’s a little, you know, spectacular. Because it really does look like every drive-in movie theater you’ve ever seen (even if you’ve only seen them in the movies). So, yes, most of you will sit in the cars as you see. But if you’d rather, you can also request one of about six picnic tables in the back! This is handicap accessible, and perfect for those with little guys in high chairs, car seats, and the like. But as completely awesome as the atmosphere is, there are a couple of drawbacks — like the very low lighting that imitates the night sky. It can be a little tough to see your food, actually. See what I mean about taking food pictures in here? Another common complaint is the short length of the film loop. You’ll enjoy clips of old, campy horror movies and concession commercials. Walt Disney even makes an appearance! But the film is only around 40 minutes long, so you’ll probably see at least part of it more than once. Your check will even be part of the fun! A new menu has debuted since my last visit here, and I was looking forward to trying some of the new dishes, as well as the ones that readers love and rave about. Let’s check it out. A hamburger + a hot dog! The Picnic Burger at Sci-Fi Dine-In! I began with a Coke, but you have the fun option to add Cherry or Vanilla Syrup here. I love this! Just like an old soda fountain. You can’t tell well in the pic, but there’s even a maraschino cherry in there. 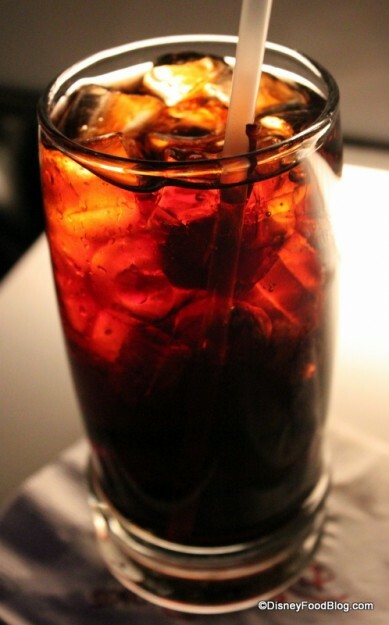 My Cherry Coke. You Can Get Yours in Vanilla, Too! But we also couldn’t pass up the Orbiting Oreos. This Grown-Up Milkshake comes spiked with Godiva Chocolate Liqueur, and it’s topped with a souvenir glow cube (which actually comes in handy for reading the menu 😀 ). We started off with an appetizer that I’ve been hearing raves about — the Fried Dill Pickles. 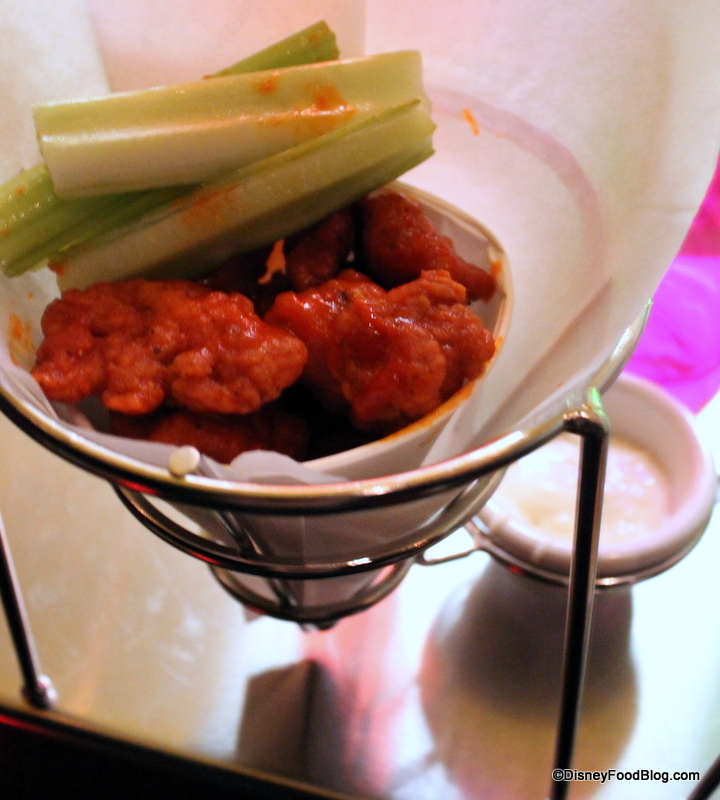 The salty-sour snack comes with a Spicy Ranch Dipping Sauce. 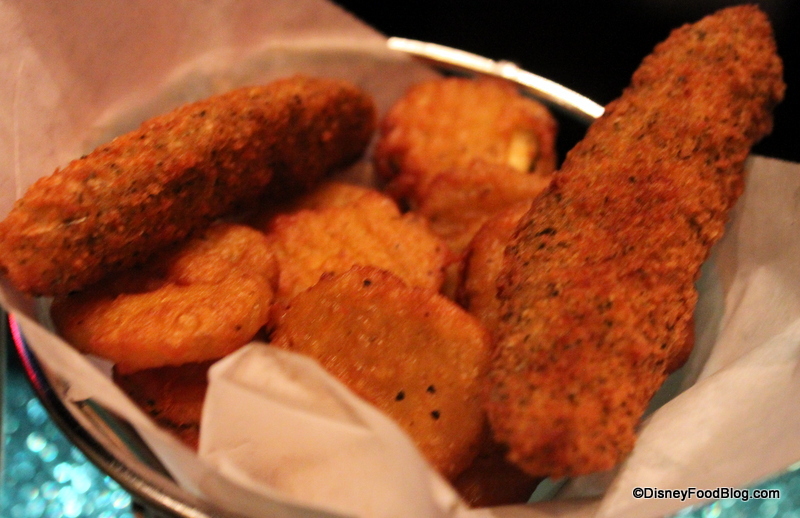 They were a little different than the fried pickles that I’m accustomed to seeing at home, which are usually just thin slices. These come with slices as well as spears. 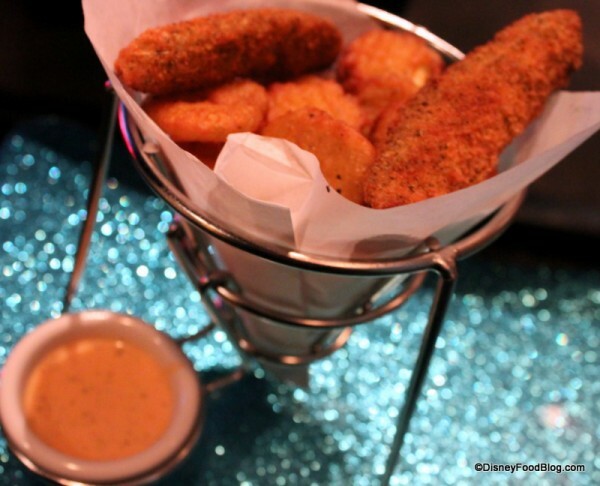 If you’re a pickle lover, the deep-fried and battered version probably make you very happy. I’m not a huge pickle fan, but I really enjoyed the light batter-type breading on the slices here! Next though, I couldn’t wait to try the Spicy Buffalo Popcorn Chicken. You guys DO know that wherever I can have buffalo chicken anything I’m going to order it, right? OK, just so we’re clear. 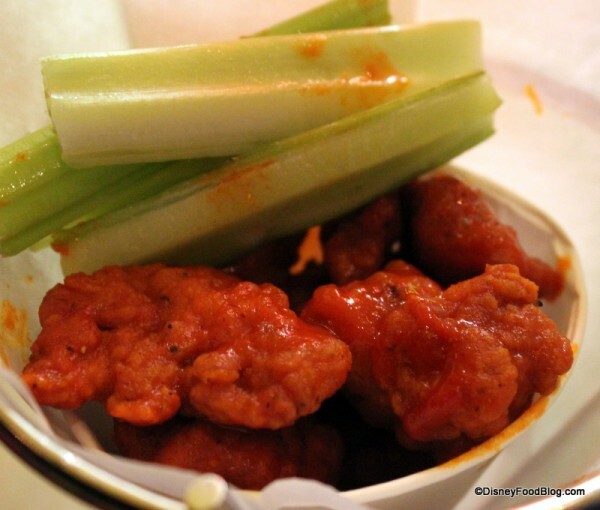 They’re served with Celery Sticks and a side of Blue Cheese Dressing. And the serving size isn’t enormous, so no worries about this ruining your meal. In fact, I really could have used a few more bites for the price. But the flavors were exactly right! The perfect way to start the meal. We also decided to give the fan favorite Reuben a try. The classic sandwich comes with your choice of Cucumber Salad or French Fries on the side (we got the cucumber salad). There was nothing particularly special about the sandwich, but it was well made and the ingredients were plentiful. I liked the toasty, buttery bread as well! 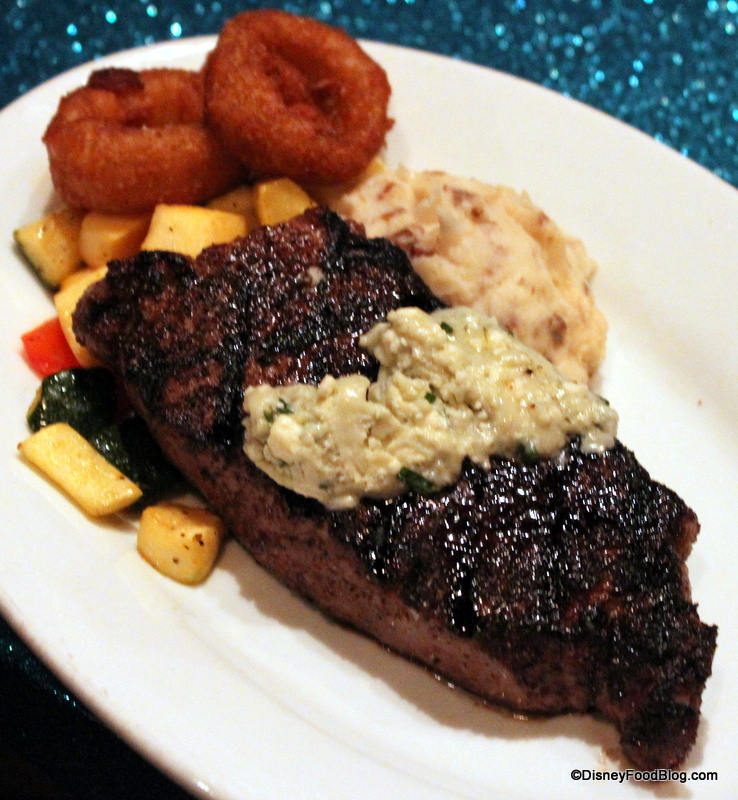 But the real winner of the night was the Flame Broiled New York Strip Steak. Served with crunchy, steamed Seasonal Veggies and creamy Garlic Mashed Potatoes, that would have been enough. But you also get a knob of Blue Cheese Butter and a garnish of those thick cut, nicely battered Onion Rings. Those little additions made this even more awesome. When I ordered the steak, the server asked if I wanted the blue cheese butter or not. I’m guessing this means that many a guest requests that it be left off the steak. I’m always a fan of blue cheese butter, though, so I left it on. It did have a strong flavor, but it complimented the steak well! We weren’t finished, though! It was time to take a look at the Dessert Menu next. A couple of the new options jumped out at us right away. 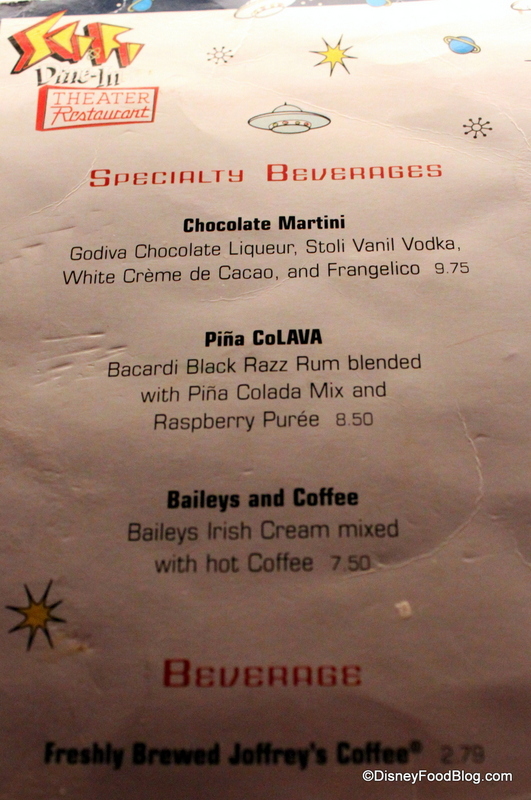 Since we’d already had one dessert drink, we decided to save that Chocolate Martini for next time. We opted for a couple of sweets with the intention of sharing. First up was the House-made Sci-Fi Candy Bar. 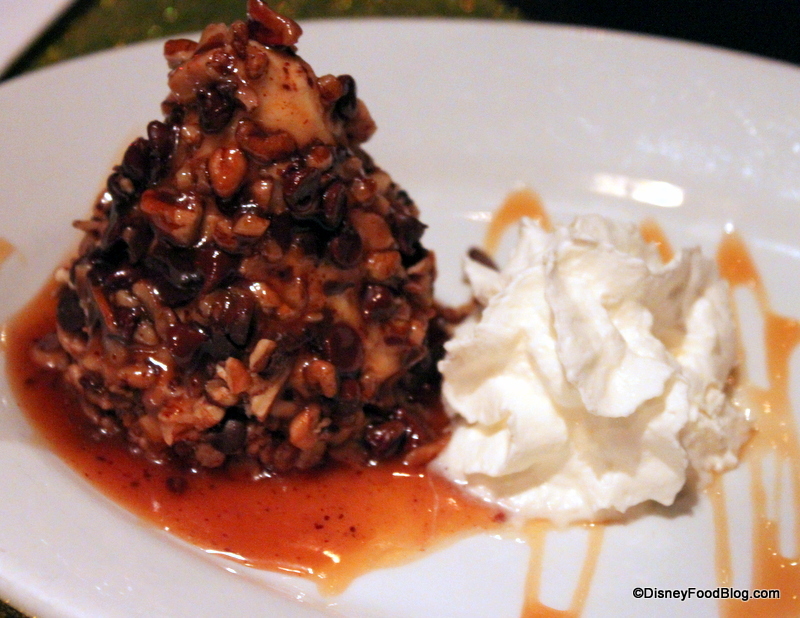 Have you noticed that “candy bar” desserts are all the rage at Disney right now? I’d been hearing about this one left and right, and knew I had to try it! The presentation was nice, and I appreciated the color from the fresh Strawberries on the plate. Cut into it, and you can see the layers of White and Dark Chocolate Mousse on a base of Sponge Cake. 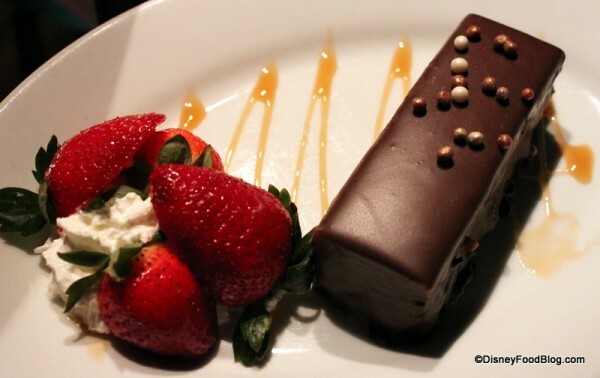 The whole thing is then covered with Ganache and topped with Chocolate Pearls — another Disney dining darling of the moment. This dish fell flat for me, folks. Not a whole lot of flavor, and I’m not a fan of sponge cake. So, while it was fine, I wouldn’t order it again. 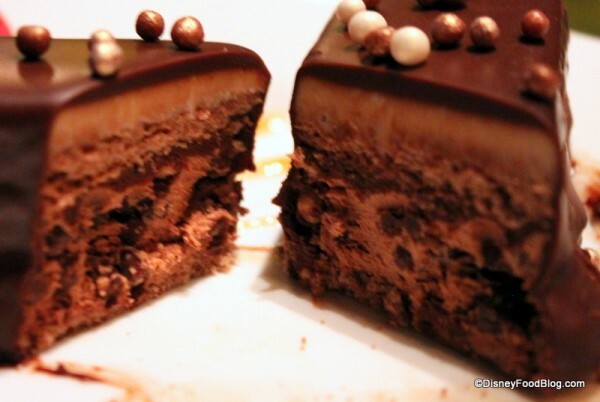 But the Out-Of-This-World Turtle Cheesecake made up for everything the Candy Bar wasn’t! Built to resemble a lunar module, this thing was incredible! 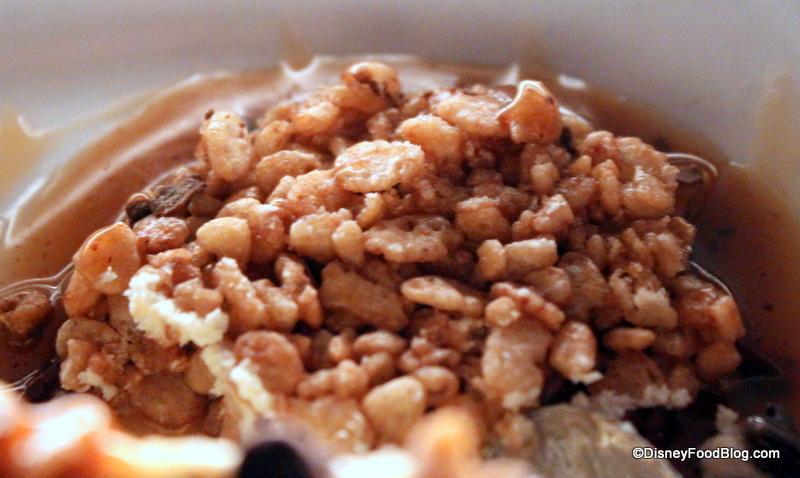 The pyramid of creamy Cheesecake is coated with Heath Bar crumbles, Pecans, and Chocolate Chips, before it’s doused in Caramel Sauce. Seriously! It pools at the bottom. Finally, a dessert with enough sauce! But that’s not all the fun. The crust is — wait for it — a Chocolate Rice Krispie Treat! Yowza! See? Why can’t all desserts be fun and delicious like this? Normally, I’m not bowled over by Disney desserts. But I think this one exceptionally good! 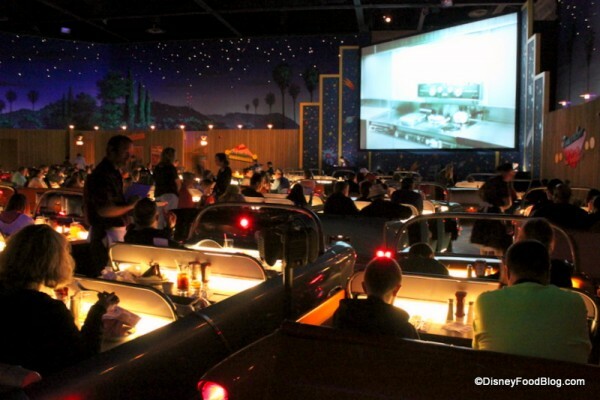 What can you say about Sci-Fi Dine-In? People love it, people hate it. Some never miss a chance to dine here, while others think that the food is mundane and overpriced. For my part, I am so in love with the gorgeous setting that I think the atmosphere alone makes Sci-Fi a Disney icon, and a restaurant that every Disney fan should experience at least once. But honestly, I was pretty impressed with my meal this time out. Sure, there could have been a few more pieces of chicken in that paper cone. But everything we ordered tasted good to great. And I really love that there’s good variety here. You can get a sandwich or a burger of course, but guests who want something a little more upscale can get a fairly decent steak at a price that’s pretty reasonable by Disney standards. For my part, I’ll keep on coming back to Sci-Fi to take in a meal in a car while watching fun old movies. It’s an opportunity to experience a bit of Americana that has largely vanished in a fun setting — complete with air conditioning. 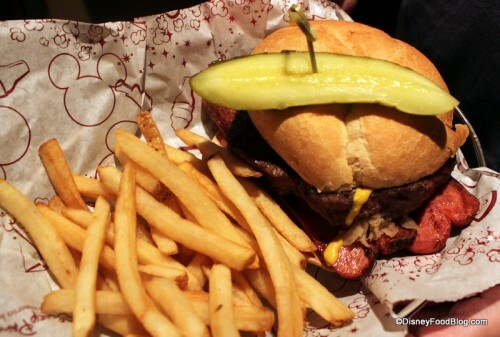 Is Sci-Fi Dine-In a favorite Disney dining experience for you? Leave a comment and tell us about it below! 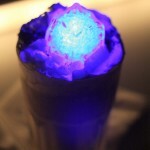 Disney Food Pics of the Week: Glow Drinks! I did try the new salmon sandwich last time, though, and coming from a island where every restaurant gets fresh fish every day…the sandwich was pretty gross. Salmon should not be fishy. 😛 Lesson learned! 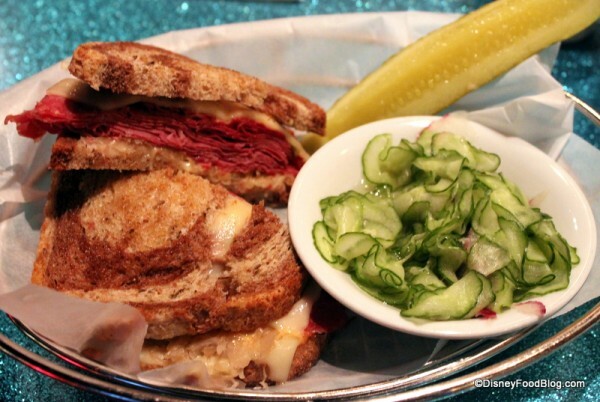 The reuben looks/sounds nice – will be going for that on our next trip! Hadn’t been in years but went with the grandkids. Everyone loved it. 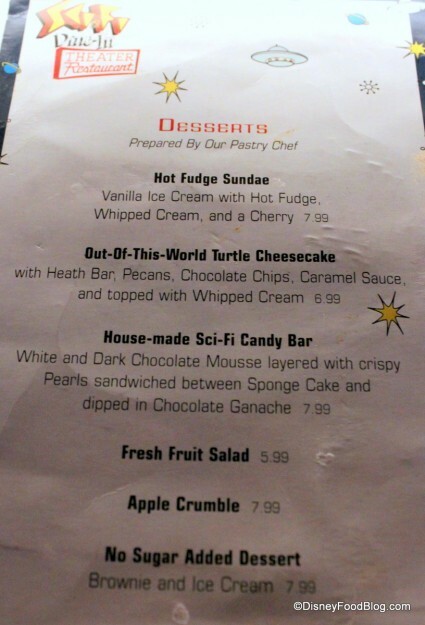 I haven’t been here in years and years, but I do remember loving the atmosphere and now that I’ve seen the Out of This World Turtle Cheesecake, it might be time for a return trip. I’m often traveling solo and wouldn’t want to take up a whole car. Are the tables in the back too out of the way to enjoy the atmosphere? We dined here in 2012, and thought the food was just ‘meh’. My DH went for the Reubens and thought it was okay, but overpriced for just a sandwich really. 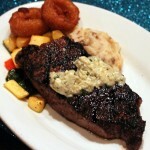 I requested the NY Strip, but without the garlic mash as I have food issues. They brought to me a plain and rather tasteless steak with fries – no option to have the blue-cheese butter, no onion rings, nothing added at all. The price wasn’t reduced though! The desserts were lovely, as were the milkshakes, and the atmosphere was pretty good, although the dimmed lighting did get on our nerves eventually! Overall, not a bad experience, but not one we would repeat hastily – there are too many other good places to dine in the Studios, in our humble opinion. We ate lunch there in December. The thing that struck me the most was how quiet it is inside the theatre! It was a really nice respite from the hustle and bustle outside. It was almost as refreshing as leaving the park for a while in the afternoon. The food was fine, nothing that I’d get hungry for, but certainly not bad. Our server was wonderful. 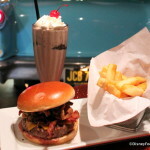 I have yet to eat at Sci-Fi Dine-In…gotta move it to the top of my must-try places! We usually eat here about every third year or so and almost always for lunch. 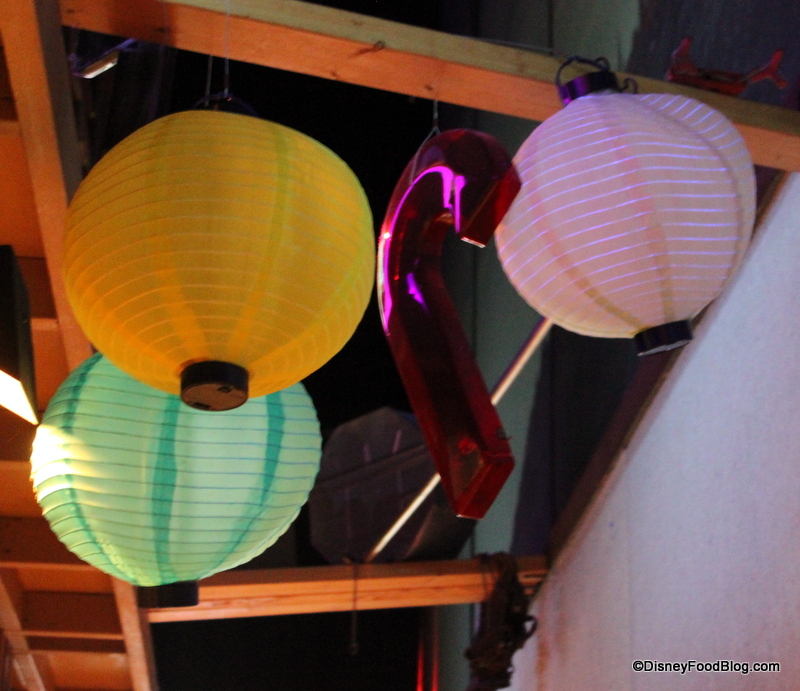 We have always enjoyed the amazing theming and the food has always been pretty good, in our opinion. Never really understood why some people think it is so bad. Most recent visit was in March with a party of 5 adults. Were seated in a car and orders ranged from burgers to a pasta dish. Everything was very tasty and, of course, the milkshakes were just delicious. We also love the onion rings – only complaint is that the serving isn’t a little larger. I would encourage people to give it a try and not be dissuaded by negative comments. The film loop is funny but, at this point, I would be happy to see a mix of a different group of films just because we have seen it so many times. Still laugh at it, though! We love the Sci-Fi Diner as well! So much fun. We went with our 2 boys, ages 10 and 7 and they very much enjoyed the unique atmosphere. I ordered the Salmon BLT. It was absolutely delicious, and I still think about it haha. I never miss a chance to dine at Sci-Fi! It’s a long-time family favorite and tradition. 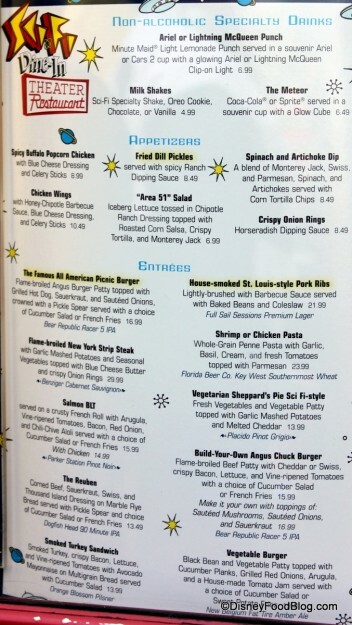 I can’t wait to try some of the new menu items! 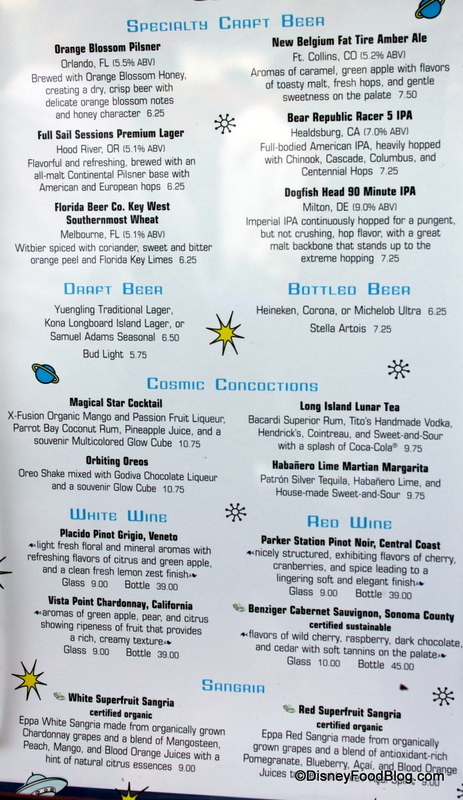 we visit Disney every Spring…..I let my girls pick on restaurant to eat at in ANY park……hands down, EVERYTIME….they choose Sci-Fi. It never gets old to them. They love the Cherry Coke and the milkshakes. We have always had a friendly wait staff who make it enjoyable too!!! The Johnons LOVE sci-fi! 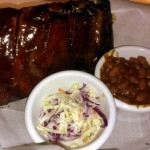 We will be eating there in a week….when we visit FL from NY! CANT WAIT!!!! Last time we went here. We went just for desserts. We had all the atmosphere without the super huge meal no one could finish. Don’t get me wrong I think the food is great but not before we go on one of favorite rides. Rockin’ Roll Roller Coaster! I’m going to have to disagree with you on the candy bar dessert! Assuming it’s the same dessert my husband & I had on our trip back in October, we loved it; we felt it was the perfect thing to have after such a filling meal (picnic burger and onion rings: overdoing it a bit? Maybe, but so worth it!). I felt it was like a fluffy Milky Way bar, only without the heavy “omg too much sugar” feeling you get after eating an entire Milky Way bar. A perfect, subtle & sweet ending, which isn’t something you find too much at Disney. I have to agree that the Sci-Fi Dine In is a lot of fun, and it’s unfair that it gets the negative reviews it does. The food isn’t out-of-this-world fantastic (and maybe it should be, considering the theming 😉 ) but goodness, the feeling of being tucked away from the rest of the World — both Disney and otherwise! — is pretty amazing. And for picnic food, I think it’s pretty delicious! It’s a fun place, but one that trades on the ambience more than the food. Not that the food is bad (I enjoyed it), but it’s nothing terribly special. Tasty but not incredible, amusing but not outstanding. You don’t go there because the food is incredible, you go there because it’s just a fun place to be and even a relaxing place in the cool and dark (when it’s hot and sunny outside). I’ve never eaten here — my wife is a pretty picky eater and nothing on the menu really appeals to her. I am a little bummed out that the candy bar dessert was a disappointment. When I was reading the description on the menu you posted, it immediately caught my eye and I was starting to think of ways to convince my wife to give the place a try. I am an admitted chocoholic, and was hoping it would be as good as it sounds (and looks). I think I’ll stick to the cupcakes at Starring Rolls. I’m glad they kept the Shrimp pasta (or brought it back, if it left) . . . I had that in June 2012 and really enjoyed it. I think it gets a bad rap for food, but I have thought it was fine – and the entrees have been better than the sandwiches, in my opinion. Had the Rueben… was delicious!!! I agree about the lighting, tho, hard to see your food. But would definitely go back. Never happy with the food. We go once a year ( I prefer 50s prime time food) but my daughter likes it. She gets an overpriced burger and overpriced sundae. I wouldn’t mind the prices if they were better but they aren’t. She loves the atmosphere. Then we go to 50s & I sit at the bar (quick seating,quick food) get my fried chicken meal while she sits and watches the old reruns on the big 50s style tv. 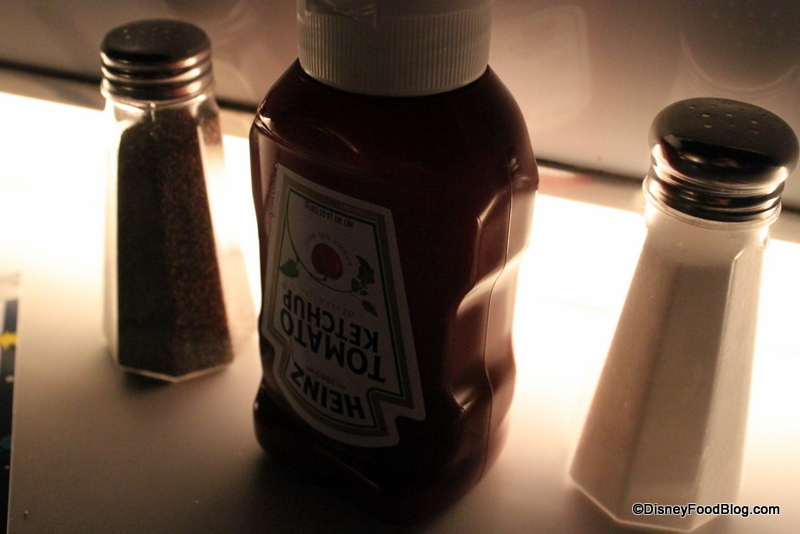 We sacrifice for what we like & it works for us…..
First I’ve been a huge fan of scifi diner for 10 years. We’ve always had fun here. I have lunch reservations there on May 4 and even though I was able to score a Star Wars breakfast there on the same day I haven’t canceled the lunch ADR yet . AJ- would like to know what you did for the lighting, the pics look good. As for the food, my wife and I never got a bad appetizer or burger there yet, and we have been going there twice a year for the last ten years. Love the atmosphere and we laugh like crazy at those corny movie clips, even went out and got “Plan 9 From Outer Space”. Looking to add to the collection. Any tips on how to take decent photographs in there? I’m especially worried for the SW breakfast, since we are paying so much just to meet the characters and take pictures of my son with them it would be a shame if we only got blurry photos. Thanks! We are planning a Star Wars breakfast here at the beginning of June. I’m a little concerned about being able to get good character photos with the dark lighting. I sure hope they plan for that for this special event. Also curious about what they’ll serve for breakfast! Man, I love this place. One of my favorite restaurants in all of WDW. Still, I wish the film loop was longer. I was there for almost 90 minutes for lunch last time, and I didn’t feel like I was deliberately lingering. A two-hour film loop would make a great place even greater. It’s mystifying why they made it so short. I neither love it nor hate it. I’ve eaten there a couple of times and had a respectable meal. I’d go again if the people I was with wanted to eat there, and I’d find something on the menu I could enjoy. But I would never choose it myself. 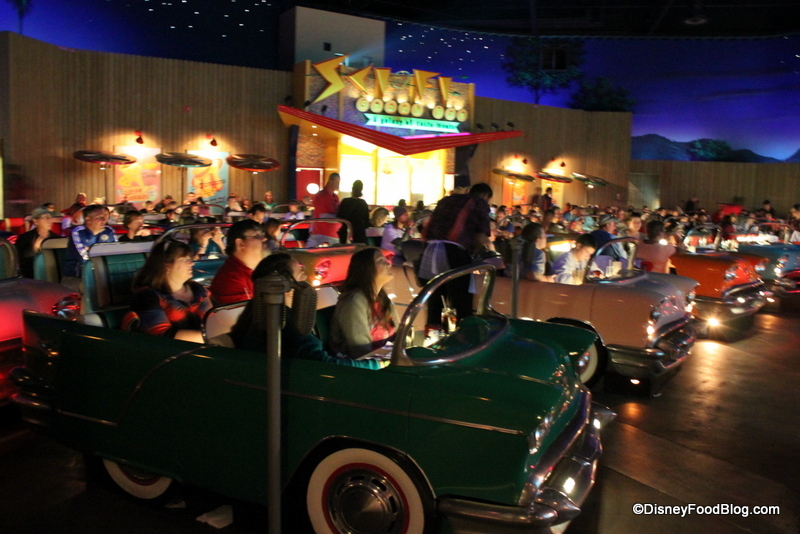 The menu just doesn’t thrill me, and as for the atmosphere, we still have REAL drive-in movie theaters around here. Any good Disney fan knows the rocket pack is from “The Rocketeer” and not just some piece of random ephemera! How cool! Bo — Exactly! And it’s right next to the rocketeer helmet at sci-fi. Are you really seated with other people? We are going for the first time in October and have reservations. But I’m not sure my kids or I want to sit with other people. Also, are the movies scary? Thanks for the review. I was really looking for a few more photos but this is good. I haven’t been to sci fi in a few years and my friends and I are heading there tomorrow during Hollywood studios 25th anniversary celebration. I’m excited for dessert, and I’m not even a cheesecake fan. omg that dessert looks like heaven on a plate!!! and i love the idea of a drive in for a restaurant. The only time i like to watch tv is when i’m eating anyway!! I am sorry. My family just ate there today and there is zero I can say good about the restaurant. To start out, we ordered an appetizer of the onion rings. It is obvious they were the frozen kind you purchase at the local grocery store. Don’t bother unless you like the frozen grocery store onion rings. I then received, quite possibly, the most dreadful and aritificially tasting milk shake I have ever had the displeasure of putting to my lips. It was the banana/chocolate milkshake. My kids seemed to like their Oreo milkshakes but all it took was one sip of mine and I just pushed it away. To add insult to injury I asked the waiter not to bring out my milkshake until my entree arrived and yet he still brought it out with my first round of drinks. I had the ribs. If a microwaved, five boned rack, with cold beans and blah coleslaw is what you envision in barbecue, you will love this food. If not, it will really leave you speechless once you realize you have dropped $23.00 on the dish. Trust me if you like good barbecue stay away from the ribs. My wife did enjoy her steak and the kids enjoyed their burgers. However, once again, the awful onion rings come with the filet. The service was pretty average too. Quite surprising to me as service has never been a problem with any Disney trip my family has taken (we go to Disney about once to twice a year). The waiter was very nice and polite but my goodness getting a refill was like an act of Congress. No kidding on the darkness. If you need reading glasses to see your menu be sure to install an app on your phone to shine a little light on the menu. Otherwise you will have your kids, or spouse, describing the menu items to you. The set up with the cars is neat and looks kind of cool, but does not lend itself to conversation. Obviously you are in a drive-in so everyone is facing toward the screen. This is a just a warning to those who enjoy to converse with family and friends over a meal. Add the very dark environment and there is very little, if any, conversation going on amongst the group. Although, for parents just looking for a break, and a little peace and quiet, that may be a good thing. LOL. Pretty cool concept. Very average delivery. 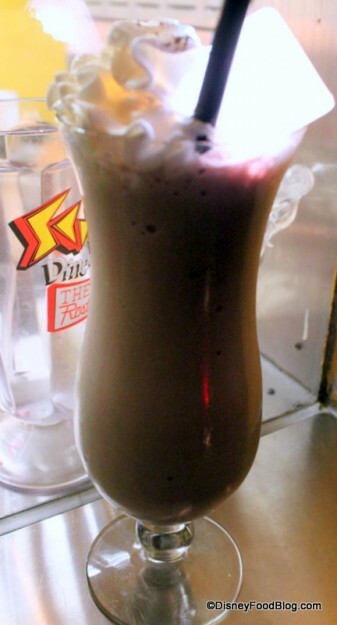 Does anyone else remember when the milkshakes were all you could drink? 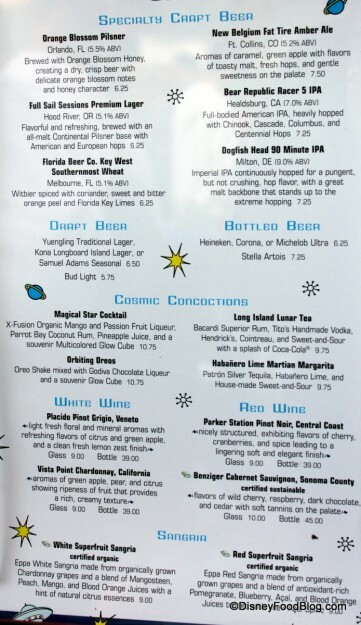 Kerry — They’re all you can drink at Whispering Canyon Cafe currently! I thought the Pic-Nic Burger was Amazing and the Candy Bar to die for!!! 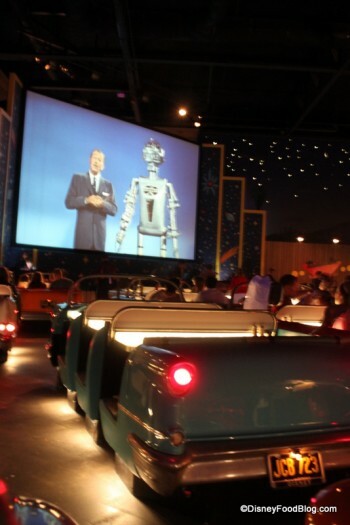 I absolutely love the Sci Fi Dine in Theater. The food is good but the atmosphere is great . We love the menu, but you need to remember you’re not going to find gourmet selections on the menu. 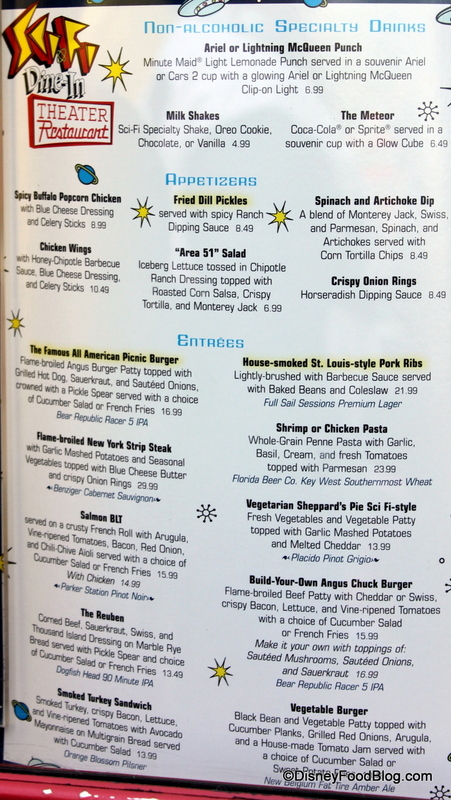 I have had burgers, the turkey sandwich but they also offer salads, pasta , ribs etc. 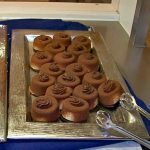 On my most recent visit I tried the house made candy bar dessert and it was awesome!! For my family this restaurant is one of the main reasons we go to Hollywood studios . The Out of this World Turtle Cheesecake is one of the best desserts I’ve ever had! I’m not a fan of the dinner menu, I think it was better years ago, but the atmosphere is so great it’s definitely a must do! That cheesecake though……it’s definitely OUT OF THIS WORLD!